On a gorgeous winter, I hiked about an hour from Hwy 31 which runs from just south of La Pine at Hwy 97 to the SE toward Reno. 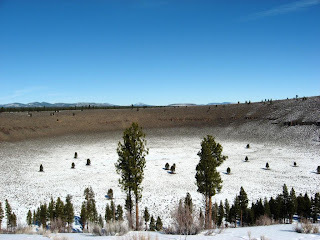 My destination-Hole in the Ground-a very unusual phenomenon about 45 miles south of Bend, Oregon and about 20 miles south of Newberry Crater (see middle left for perspective). Hole in the Ground is just that. 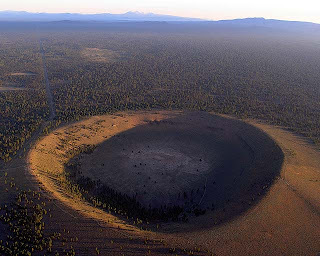 A giant crater that measures probably about a mile across and several hundred feet deep. It is a maar which is effectively a low volcano that came into contact with a groundwater table as it exploded about 13-18,000 years ago when this area was under a huge lake. Very isolated, very unique and beautiful. You really get a sense of the scale of this thing when you see it from the air. 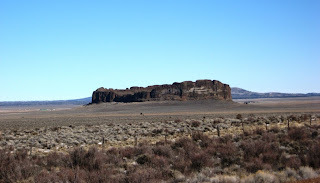 That ancient lake that covered the area is most noticeable in the Fort Rock/Christmas Valley area. 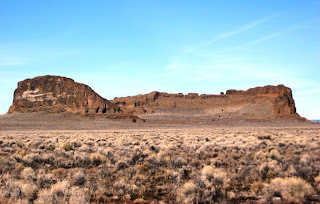 Fort Rock is also a maar volcano about a mile wide and 200 feet high. From the south, the rim of the maar was breached by the lapping of waves from the lake. This breach provided an opening of which ancient peoples could access via canoe. The discovery of this activity was proven in the artifacts found here about 100 years ago. An amateur archeologist found a cave in this formation that had a stash of about 70 pairs of woven sagebrush sandals. The sandals were tested and found to be about 9,000-13,000 years old. This discovery was major as it advanced the known wisdom at the time about the settlement of North America. The find pushed the date of humans activity on the continent back about 4,000 years! 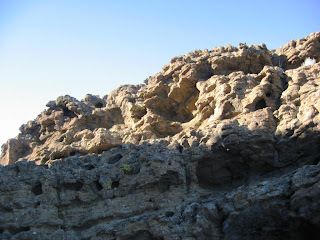 Further evidence of the interplay of water and rock here near the top of the east rim. The scale and grandeur of this place is amazing. 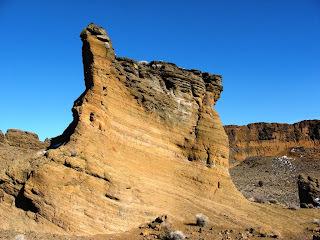 Layers of rock, exposed from years of erosion tell the tale of the volcanic activity. Play the vid below for a panorama from inside Fort Rock. Music by Stereolab.